This one bedroom apartment is one of our Olympia apartments Tenerife. It is a penthouse apartment on the 7th floor with fantastic sea and pool views. It was our first visit to Tenerife. 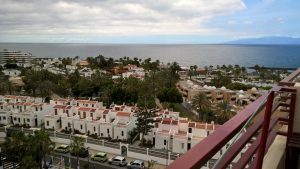 Karen Durant from Holidays 4U recommended us to a one bedroom apartment on the Olympia aparthotel in the San Eugenio area of Tenerife. We were not disappointed. The best thing about the apartment was the fantastic views. Not only did we have a pool view, but a fantastic sea view. This was due in part to the fact that the apartment was on the 7th floor, which is the top floor. It is always nice to be in a penthouse as you don’t have the problem of people making noise above you. Even the sound of someone pushing a chair back can seem incredibly amplified. The apartment was very clean on arrival and the towels and linen provided were of a good quality. The apartment also had the advantage of having a washing machine as well as satellite TV with some English channels. The complex is well located as it is close to lots of nice restaurants and bars. The beach is also a short walk away. As far as I understand if you book a room through the hotel it will be cleaned every day except Sundays. As we booked a privately owned apartment, it was cleaned before our arrival and that was the limit of the service. But we were told this before we arrived so it was not a problem. And we were given local contact details of the cleaner and could have booked an additional clean if required. The owner also left us a welcome pack for our arrival which included some water and wine. That was very welcome as we arrived on a late flight.